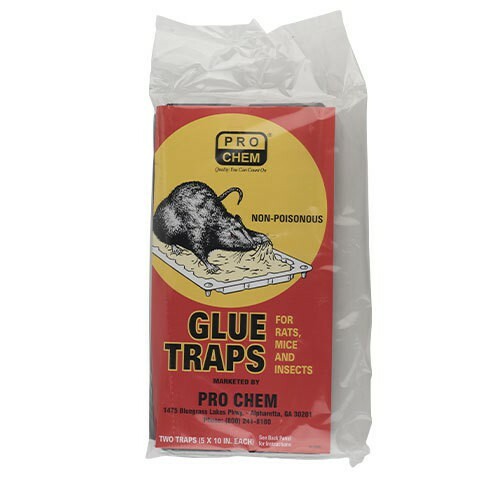 Glue Traps | Pro Chem, Inc. Rats & Mice: Separate the GLUE TRAPS along the scored hinges and place lengthwise, glue-side up, against walls or wherever rodents are known to travel. To attract rodents more quickly, place peanuts in the trap. Insects: Separate the GLUE TRAPS and place where insects are normally found, such as in cabinets, pantries, under sinks or by refrigerators. To attract insects more quickly, place several pinches of sugar in center of trap. Do not expose GLUE TRAPS to extreme heat or damp conditions. In dusty areas, lean boards against the wall over the traps. GLUE TRAPS can be secured to beams and pipes with wire. Use double sided tape to secure traps to floor. GLUE TRAPS are non-poisonous. Caution: Do not place traps where birds or non-target animals may come in contact with the adhesive. Should any of the adhesive accidentally get on hands or floors, it can be washed off with alcohol or with nail polish remover.